While their pictures and videos are going viral, here’s everything you need to know about this grand and ‘secret’ wedding. 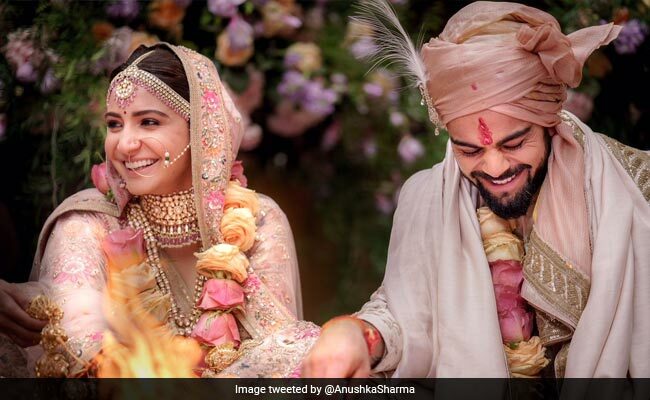 While we loved the entire look of the event, what’s extremely fascinating is the time, effort and money Virat spent on ensuring he has the perfect ring made for Anushka. The huge ring was crafted by a skilled designer from Austria, and is said to have him cost more than the rent for their wedding venue! Yes, you heard us right. The diamond ring is believed to be worth around one crore! Well, we’re sure nobody will be able to take their eyes off the stunning ring whenever Anushka wears it. The couple had all the typical Hindu pre-wedding ceremonies and functions in Italy, which included the sangeet. 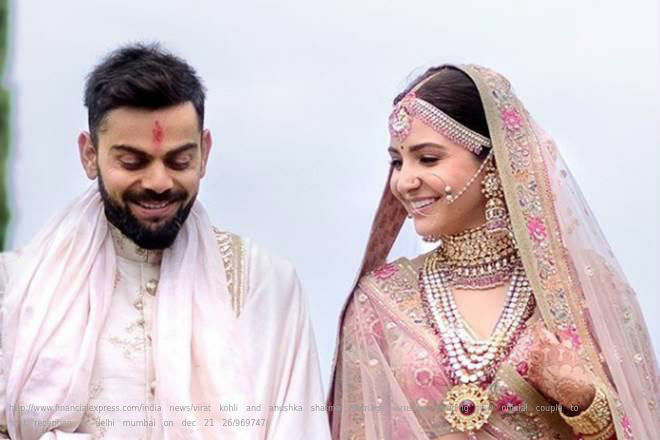 In a video that’s seen on YouTube, Kohli is singing mere Mehboob Qayamat Hogi for his sweetheart, while Anushka cheers him on and applauds his performance at the end. A lot of celebrities are also present in the audience, smiling as he croons the romantic song for his wife-to-be. We don’t know if this is from the actual sangeet in Italy or from an earlier event in India. However, it’s super adorable and all Virat’s fans are going gaga over it! Do check it out! Mehendi is an important ceremony in every Indian wedding, Virat and Anushka didn’t miss this function among the other events. They were decked in traditional attire and wore big smiles on their faces. 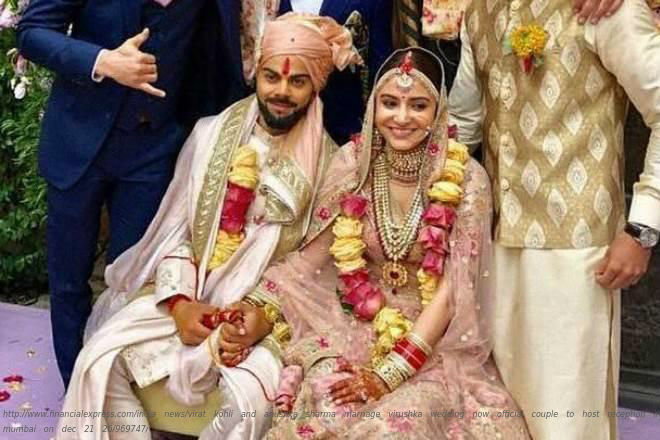 Virat looked great in his white and red outfit, while Anushka was all smiling in her colourful attire as she showed off the mehendi art on her arms. The grand ceremony was a private affair that took place in Borgo Finocchieto, a countryside resort in Tuscany, Italy, and was graced by both the couple’s families and close friends. The pair definitely looked like a match made in heaven, as they tied the knot. The ceremony was conducted as per the traditional Hindu rituals. Both Virat and Anushka were dressed in Sabyasachi outfits for their big day. Anushka donned a pale pink lehenga that flaunted delicate embroidery and wore alluring gold jewellery and flowers in her hair, that completed her look for the wedding. She also had the full chooda on, with all the red and white bangles and gold bracelets, which are essential elements of any Punjabi bride’s look. Virat too looked amazing in his ivory raw silk sherwani that was embroidered with fine details. He paired it with a rose silk kota safa. They’re expected to host two receptions for all their friends from the respective industries. One will be in the Taj Diplomatic Enclave at New Delhi on 21st December 2017, as seen on the invitation card below. This event will be reserved only for both the families and some close friends of the couple. They are also reportedly going to host another bigger reception in Mumbai on December 26th for their friends from the entrainment industry and cricketers. We’re super excited for both! After their receptions, the couple will be heading to South Africa for a short honeymoon. Virat is going to begin his preparation for the much awaited South Africa series and they will be celebrating New Years together. Anushka will then leave for India and continue shooting for her untitled Anand L. Rai film where she will be paired opposite Shah Rukh Khan. They will be moving to their new residence in Worli soon. We’re sure as Virat Kohli and Anushka Sharma are bound together in marriage, all their fans are celebrating all over the country. Here’s wishing the power couple a blissful married life full of love and happiness! « How to Design a Professional Looking Wedding Card (DIY)? The Stunning Engagement Ring & All About Virat-Anushka's Wedding. Overall rating: 4.7 out of 5 based on 235 reviews.